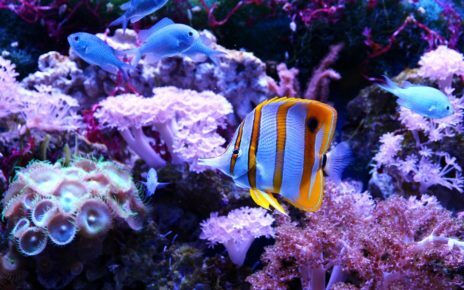 Finding the right light for an aquarium is always an important decision. This is especially true if you plan on keeping GloFish. In order to bring out their bright vibrant colors, you will need to get a fixture that emits more light in the blue part of the spectrum. Continue reading on to learn more about the best lights for GloFish. Otherwise, if you just want to know our top picks, we recommend the GloFish Cycle Light (Buy Online) for small tanks, and the Beamswork 6500K LED (Buy Online) for larger aquariums. 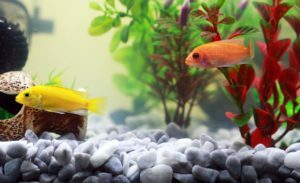 In order to better understand why GloFish require special lighting, you need to know why GloFish glow in the first place. 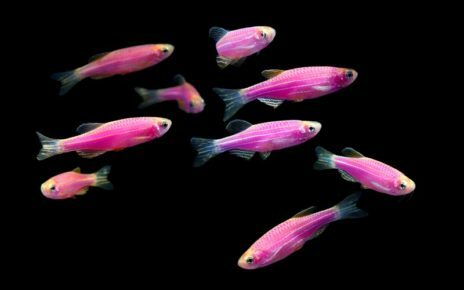 GloFish are genetically modified fish that have DNA from other species inserted into their genome. 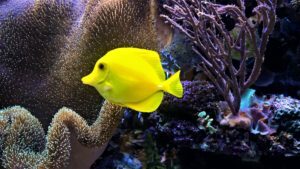 The genes that produce the vibrant fluorescent colors that you see in GloFish come from a few different species of jellyfish and coral. 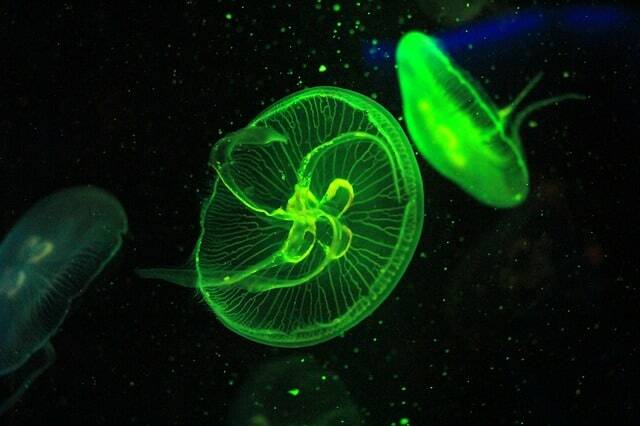 While these pigments don’t actually “glow”, they do fluoresce under certain lighting conditions. In order to excite the fluorescent proteins, you need to expose them to energetic light in the blue or ultraviolet spectrum. This can be achieved by either using blue LED’s, or you can use a blacklight. The blue LED’s will be brighter and more suitable for daytime viewing, while a blacklight will make your GloFish fluoresce more, but the light will be dimmer. 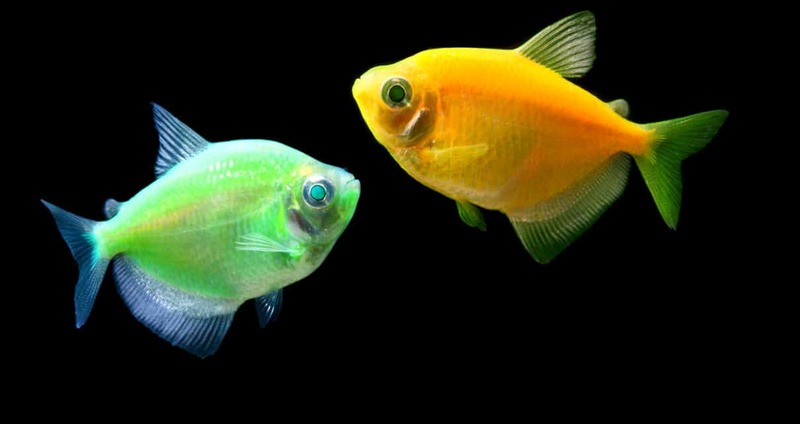 In most cases, though the best light for GloFish is a LED light that has a mix of white and blue LED’s. These types of LED aquarium lights usually come with an option to run just the blue lights, or you can have both the blue and white lights on together. Viewing your GloFish under blue light alone will allow you to see your GloFish fluoresce without the white light overpowering the light emitted by their fluorescent pigments. 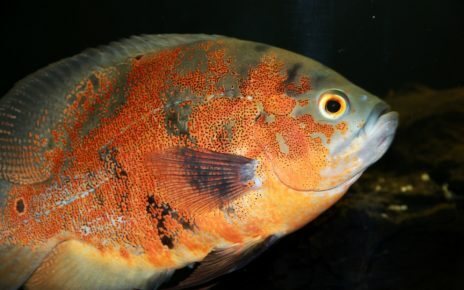 Then when you turn on the white lights along with the blue lights, the combination of the two will still make your fish look more colorful and vibrant. 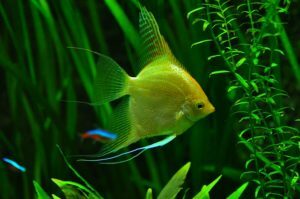 The GloFish Universal Aquarium Light (Buy Online) is one of the best lights for a GloFish aquarium. The great thing about this light is that it is very compact and easy to attach to almost any size aquarium. The adjustable clamp at the base of this fixture is made to fit normal aquariums with black plastic frames, and it will also attach to aquariums that are completely frameless. The GloFish Universal Aquarium Light comes in two sizes. One model is made to fit fish tanks up to 15 gallons, while the other will fit aquariums up to 30 inches. The smaller model has 24 blue LED’s, while the larger model has a total of 45 blue LED’s. They both have a similar design and mounting mechanism, the only difference is the length and width of the fixture. The only real downside to the GloFish Universal Aquarium Light is that it doesn’t have any white LED’s in the unit. If you prefer the look of blue LED’s then this is not a big problem. Otherwise, if you want a light that also has white LED’s, I recommend you look at some of the other lights in this article for some better options. The Beamswork 6500K LED (Buy Online) is a very affordable light that has all the features you need in a light for a GloFish aquarium. This light comes in multiple sizes that will fit aquariums that range from 18 inches all the way up to 72 inches. The Beamswork light uses 6500 Kelvin white LED’s that will fill your tank with a natural white light. The 0.5-watt white LED’s are also strong enough to grow some low light plants in your aquarium. Each Beamswork light also includes a set of 460 nm blue LED lights in the fixture. These lights can either be turned on separately in night mode, or they will blend in with the white lights when you select the daylight option. This light can also be paired with an optional timer, which is great if you are growing plants, or if you just want to maintain a regular lighting schedule. The timer also has two separate modes, so you can have it run just when you are home, or you can use the other mode as a security light if you are away on vacation. The Finnex FugeRay Aquarium LED Light (Buy Online) offers a nice set of professional features in an affordable package. This light is just the right size for use on a 5 or 10-gallon aquarium. The Finnex FugeRay Aquarium LED will also easily clip onto most fish tanks including rimless designs. The adjustable arm on this fixture is another nice feature that will make it easy to adjust the position of the light depending on your preference. The real standout feature of the Finnex FugeRay Aquarium LED Light is that it incorporates a mix of red, blue and white LED’s. The red LED’s are particularly unique since they are 660 nm red LED’s. If you plan on growing plants in your aquarium then these 660 nm red LED’s will provide your plants with the proper spectrum they need for strong healthy growth. The blue LED’s, on the other hand, can be run separately in a moonlight mode, or they will run at all times when the light is switched into the daylight option. The blue LED’s also play a role in plant growth, so they also have that added benefit. This light is comparable to the GloFish Universal Aquarium Light in both price and form factor, but you get a lot more features for your money with this fixture. The Finnex FugeRay Aquarium LED Light is a great choice if you want a light that will make the colors of your GloFish pop, but you also want a light that emits a natural color. The GloFish Cycle Light (Buy Online) is a great light to get if you already have some GloFish brand decorations. These lights come in multiple size options that will fit aquariums that range from 5 to 55 gallons. This light is specially made to interact with GloFish decorations to create unique lighting effects that wouldn’t be possible with other types of lighting. The four individual light modes that this light emits will create different glow effects when used with decorations that are made to respond to the cycle lights colors. The four different light modes will also let you choose the color of your tank to match your mood, or the colors can be changed to match the time of day. Unlike most lights that only offer daylight and moonlight modes this light has a twilight and a midnight mode. These additional modes give off a more subtle hue of light than a pure blue moonlight mode. This is great if you still want to see your GloFish “glow”, but you want a little more natural color than the blue LED’s can offer. The GloFish Blue & White LED Light Stick (Buy Online) is an excellent addition to any small or large GloFish aquarium. These lights come in a number of sizes that will fit aquariums from 5 gallons all the way up to 55 gallons. These lights are made to easily attach to the frame of any standard aquarium. That means you can use any type of hood or lid with these lights without having to worry about compatibility issues. These lights unobtrusively mount inside the lip of your tank, so you can even use these lights on a lidless aquarium. Since these lights actually sit inside the aquarium they are waterproof and extremely durable. 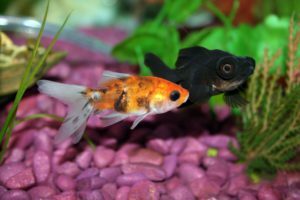 Even if they are accidentally dropped in the fish tank they will continue working. If you are interested in more submersible lighting options, you can scroll down below to read our review of a good submersible light that also has a remote and color changing RGB LED’s. One of the really nice things about these lights is that they use both blue and white LED’s. The blue LED’s can be turned on separately or they can be run in conjunction with the white LED’s for a more natural color. That makes these GloFish light sticks a great alternative to the GloFish Universal Aquarium Light if you prefer a more natural lighting spectrum. The Smiful LED Submersible RGB LED Light (Buy Online) is a great option if you want to add some extra light anywhere in your aquarium. This light measures in at 7 inches, which makes it the perfect size for use as the primary light for smaller aquariums. This light contains 15 RGB LED’s that can be controlled with the included wireless remote. Each LED can produce 16 colors, and they have 4 separate modes. The modes include flash, strobe, fade and smooth. In addition, this light can be set to run on a continuous color change mode if you want to watch your tank cycle through all the colors. This light is IP68 Waterproof rated, so you can mount it at the top of your tank, or you can place it on the bottom of your tank without any problems. The light will easily attach to any fish tank using the included suction cups. You can also hide this light in decorations, or you can place it behind a bubbler if you want to use it as accent lighting. 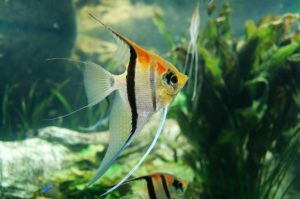 Overall this light can act as a primary light in a smaller aquarium. In that case, you can mount it up high right at the water line and it will fill the tank with a myriad of colors. 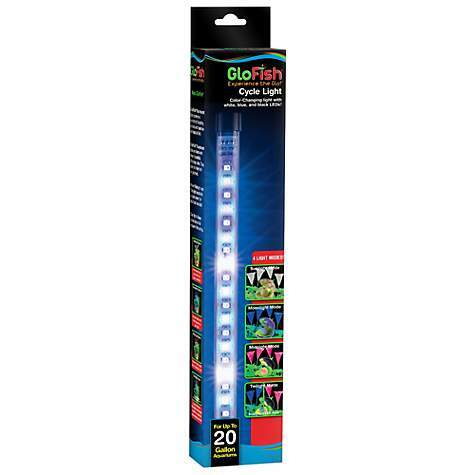 Alternatively, you can add this light to a larger tank to help enhance the color of your GloFish.